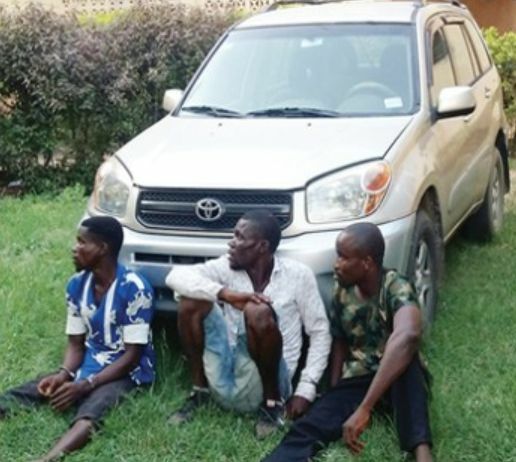 Sergeant Anthony Okologbo, attached to Nigeria Army Engineering Regiment, Onitsha, Anambra, has been arrested by policemen from the Delta State Police Command for driving a stolen vehicle. 32yrs old Okologbo was intercepted in a stolen Rav4-Jeep with registration number EKY 297 EJ. He was driving the car, while in army uniform and had two other occupants with him. The two occupants have been identified as Kelly Ogun, 38, of Peoples Club, Mkpor Road, Onitsha and Chiko Kiku, 25, of Ugberami community, Ughelli, Delta State. Okologbo, who allegedly attempted to run after being arrested, allegedly struggled with men of the Dragon Patrol Team 22, stationed along Kwale/Ogwashi-Uku highway, before he was overpowered. He was said to have struggled with the policemen after they asked him for the vehicle particulars. The Delta State Commissioner of Police, Zanna M. Ibrahim, yesterday, disclosed that upon search of the car, the vehicle particulars were found and indicated that a woman, Florence Uboh, of Ogunu road, Warri, is the owner. As Ibrahim was briefing journalists that Okologbo is a fake soldier, Okologbo angrily warned the CP to stop disparaging him, insisting that he was a serving soldier. He urged the CP to carry out proper investigations before concluding. The suspect did not stop at that, he told those that cared to listen that even if he should explain his role in the crime, nobody would understand.